Who has time to cook every meal you make? Not I. Which is why you should cook in bulk. Make 3 days worth of lunches so you don’t have to worry about meals for a few days. 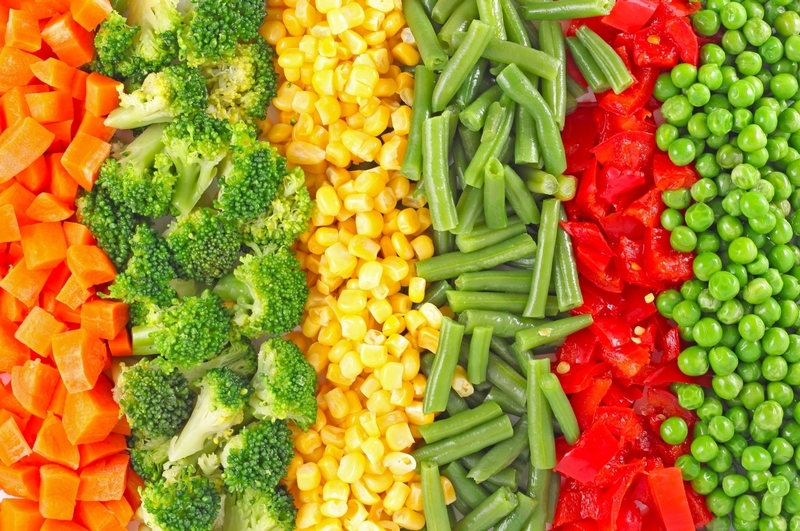 Here are a few healthy options with fewer carbs (aka the Devil) that you won’t dread heating up come lunch time – you may actually get excited! And the best part is, all of these meals are super easy to prep and won’t require a lot of time. Sorry Chipotle, we cannot afford the 1200 calories in one burrito bowl right now, we have to fit into a bikini on our trip to Miami next month. I buy the quinoa, corn, and black beans in the frozen section, which saves you quite a few steps. Cook the ground turkey in a saucepan and add taco seasoning. In 3-4 Tupperware (depending on how much you have for ingredients), divide the quinoa, turkey, beans, tomatoes and corn. If you’re packing this for lunch to take to work, bring a container with the lettuce, avocado and greek yogurt separately. Heat the first container with the turkey meat, and top with the lettuce, tomatoes and avocado(1/2 an avocado per Tupperware is enough). I’m trying to cut out dairy, and the avocado is a creamy enough substance to replace sour cream, but if you are REALLY craving it, try a scoop of greek yogurt instead- much better for you! Fake carbs, our prayers have been answered. You’ll need a vegetable spiral maker for this. I got mine at Marshalls for $5.99. 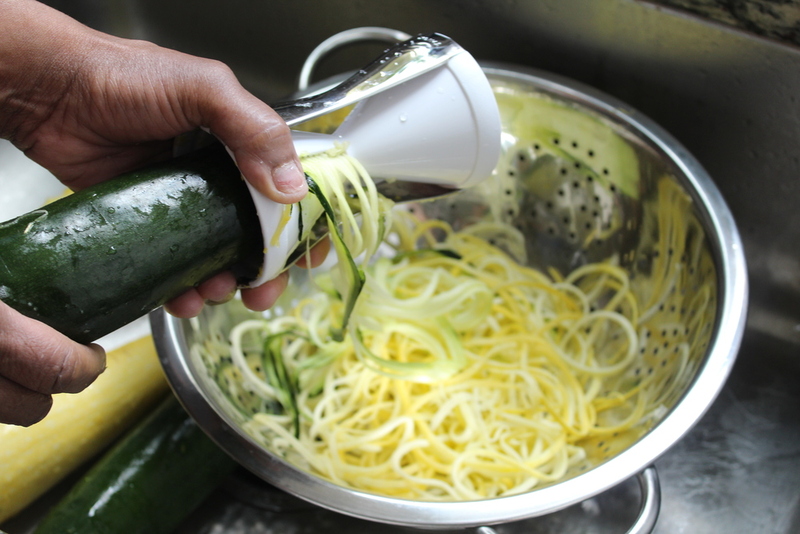 Peel two medium zucchinis with the spiral maker. Heat a sauce pan with olive oil and steam the “zoodles” for about 5 minutes. Add in salt, pepper, and garlic powder and stir and cook for another minute or so. Remove from heat and set aside. Chop up each link of chicken sausage. Cook on a pan on each side until brown (I like mine more on the black side). Add in red sauce. Divide the zoodles into 3-4 tupperware. Top with he chicken sausage and red sauce (add extra if needed). You’ll forget it isn’t real spaghetti! Probably the easiest of all, but delish & carb free. 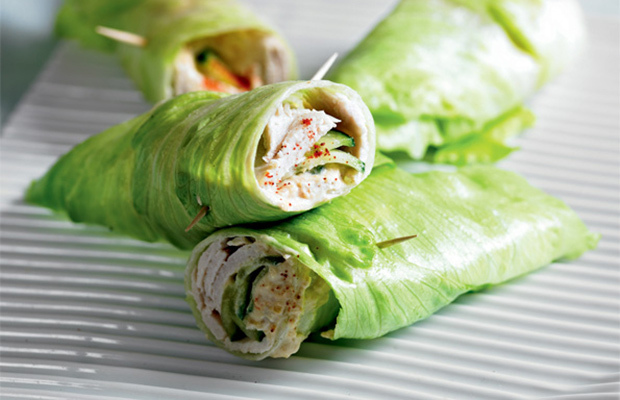 Either peel a layer of iceburg lettuce or use a romaine heart in place of a wrap. You might need 2-3 of these to fill you depending on how big the lettuce wraps end up being. The key is lots of protein. Don’t be shy with the amount of turkey you use. Spread some mustard on the lettuce wrap. Thinly slice avocado and layer a few slices on top of that. Followed by the turkey and cheese, salt and pepper. Roll and use a toothpick to secure. These lettuce wraps aren’t the strongest. If you’re bringing them to work, I suggest just bringing the ingredients and making there, it only takes a minute! Enjoy your carb free wrap. Thaaaat’s right – I said Pizza! We’re back to my favorite fake carb again, zucchini. Cut the zucchini in halves lengthwise and scoop out the insides. Preheat the oven to 350 degrees. Heat olive oil in a saucepan over medium heat and add in the zucchini until tender. 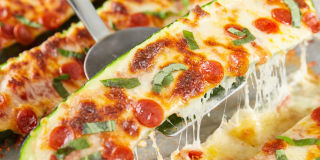 Place the zucchini on a large baking sheet. Pour on the marinara sauce, then top with cheese and turkey pepperoni. Bake for about 15 minutes or until cheese is golden. It’s a pizza party! The good thing about these guys is that you can freeze them and reheat them in the oven or microwave as you please. Your coworkers are so jealous. This entry was posted in Recipes and tagged healthy, Recipes, Wine. Bookmark the permalink.